It will be a sad day for NCIS fans come May 8. 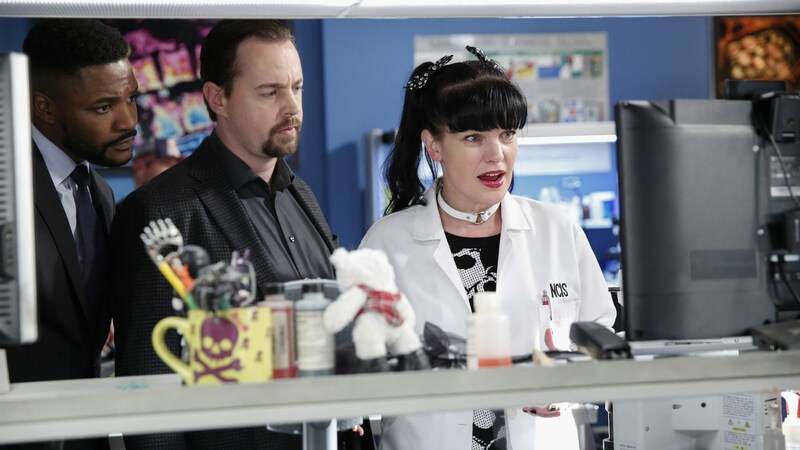 Pauley Perrette will take her final bow as beloved forensic scientist Abby Sciuto. Thankfully, her goodbye will be over the course of two episodes starting on last night’s episode and concluding the following Tuesday. The NCIS Season 15 finale airs May 22, so Abby will make her grand farewell before it airs. It’s going to be a strange dynamic when NCIS returns for Season 16 (yes, it was renewed) and Abby is nowhere to be found. There’s no replacing her, and the CBS procedural probably would never try to do that. Though, as hard as it might be to accept, someone is going to have to come in and fill Abby’s platform shoes. Gibbs’ team needs a forensic scientist to help them solve their cases. So, who will it be once she departs? That remains unknown right now. Warning: Spoilers ahead for NCIS Season 15, Episode 21, “One Step Forward,” which aired Tuesday, May 1, 2018. Based on the way Tuesday’s episode ended, well, it sure seems like Abby’s fate is grim. After having dinner with Reeves, they were robbed at gunpoint. The man fired the gun, but the episode ended before we could see if anyone was shot. However, based on next week’s promo, it appears she was shot and is now in the hospital. At one point in the teaser, McGee makes it seem like Abby might not make it. Abby getting shot may or may not impact her exit, but until we know for certain, let’s theorize on how NCIS will write off Abby. More: Did You See Pauley Perrette’s Final Goodbye to the NCIS cast? It’s hard to even write this, but NCIS hasn’t been shy about offing characters before, so what’s stopping the show from killing Abby? Again, Abby could easily die from the gunshot wound, which would definitely be heartbreaking. NCIS has been known to kill off plenty of its major female characters. Ahem, Kate, Jenny and Ziva. Let’s keep those fingers crossed the only coffin Abby ends up in is the one she sleeps in — and alive. She’s worked at NCIS for a really long time. Maybe Abby realizes she needs a change, especially after the armed robbery? It’s natural for people to decide a change is necessary. Although, Abby has always seemed really happy doing forensic work, especially with her team. She also isn’t scared off easily. Whatever the case, Abby knows what’s best for her, and if that’s moving onto something else, well, that’s OK.
Abby’s family has been a big part of her storyline. From the get-go, fans have heard about her adopted parents and adopted brother. Then, there was that time Abby learned she had a biological brother. There’s always the chance her family will come back into play somehow — and take her away from NCIS in the process. If Abby survives getting shot, maybe her family will convince her it’s best for her to move on from NCIS now more than ever. Abby doesn’t usually let someone influence her that much, especially when it comes to her job, but she may have a new perspective after her ordeal. that's true too cause she runs her own lab any way she wants and has a great working relationship. so unless she was offered a job that was even more challenging or her dream job I duno why else she would leave. Abby is no stranger to receiving job offers, but she’s also never taken them. If Abby were to receive a dream job offer or a position too good to turn down, she might take it. Maybe there’s even been a job offer that’s been being dangled in front of her for some time now? If so, a gunshot wound might influence her to take a new position. It’s always seemed like Abby was blissfully happy at NCIS, but she might very well want different things for herself now. There is a fan theory going around that Abby is an alcoholic. During an episode this season, Gibbs brought up a friend struggling with alcoholism and how they’re in recovery. A name was never specifically mentioned, but fans immediately thought of Abby, especially since she comes from a family of alcoholics. Many viewers wondered if this has to do with Abby’s exit storyline. Now that fans know Abby is in the hospital and might not survive, it doesn’t seem likely alcoholism will factor in, but it’s just another theory to think about. This doesn’t necessarily have to do with how Abby will leave, but it’s worth noting. In Episode 17 of this season, we were introduced to Ducky’s assistant, Kasie (played by Diona Reasonover). She got along easily with everyone, but it was her connection with Abby that stood out. At first, it seemed like Kasie didn’t like Abby, but it was actually the complete opposite. She admired Abby and her phenomenal work. It was also mentioned Kasie has a background in forensic science. Hmm… why else would that be dropped? There are some fans who are speculating Abby could end up in witness protection somehow. This would definitely be quite the twist, but what could force this to happen? Maybe it has to do with the next theory? A character from her past returns? Could it be her stalker/ex-boyfriend, Mikel, from Season 3, Episode 21 titled “Bloodbath”? That’s what some fans are guessing. Plus, showrunners Frank Cardea and George Schenck told TVLine about Abby’s last episodes, “Not only are there heartfelt and nostalgic moments, we have a very special reveal for the fans.” Whatever that means. Does this person from her past have to do with the hit man mentioned? Did her stalker hire someone to shoot Abby? If so, does this force her into witness protection? At this point, the options seem endless. However Abby’s written off, let’s hope she’s given the proper send-off. Unlike with Tony’s final season, there haven’t been many hints so far, save for her getting shot, about how Abby might leave, which is a bit worrisome. When she departs, will it even make sense? Will it be quick and pointless? Will it be meaningful? Will she and Gibbs have one final special moment together? Will it be a celebration of the character who’s empowered women of all ages? Sadly, this season hasn’t focused a whole lot on Abby. There should’ve been more Abby stories allowing her to truly shine even more than usual. Here’s hoping Abby’s final storyline honors her like both she and fans deserve.